I don’t tend to read too many romances, but when I do, I want them to be a complete escape from reality. 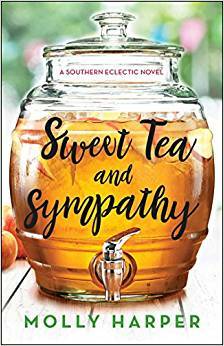 And, that is just what I got when I read Sweet Tea and Sympathy by Molly Harper. I mean, how is possible to not get an escape from the chaos of this world and the upcoming holidays when you read a book that manages to combine event planning, funeral homes, bait shops, big Southern families, and romance? Simply put – it’s not. You have no choice but to escape into this world of hilarity and ridiculousness when you read it. And, for me, that is just delightful. Short story – Margot is a big city event planner who ends up losing her reputation because of an event snafu involving exotic birds and a shrimp tower. Her saving grace winds up being her eclectic, Southern funeral/bait shop owning family in Georgia who offers her a job when no one else will. To make it even more exciting, this is a family she has not seen since she was a wee little thing and her mom left town. So, she goes from planning elaborate events to funerals in a small town. Along with a hilarious cast of characters, she meets a dreamy widowed principal with daughters of his own. I’d call it a mash-up of Hallmark/Steel Magnolias/The Holiday. Basically, a fun little romp away from literary fiction without ending up like the scandalous pages of Harlequin paperbacks or the tear-induced Nicholas Sparks sagas. While some of the Southern culture was explained a little too much for someone born and raised in Georgia, I still appreciated what the author was trying to do here. I’m willing to bet quite a few of my friends and blog followers are going to enjoy this one. * You may preorder this book (it comes out 11/21/17) from Amazon here. This is an affiliate link. Thank you for supporting my blog!